Development of the battle tank was undertaken with the cover designation ZW, and prototype orders were placed with Daimler-Benz, Krupp, MAN and Rheinmetall during 1936. The Inspectorate for Mechanised Troops wished the ZW to be fitted with a 50-mm gun, but the Ordnance Department pointed out that the infantry’s standard anti-tank gun was a 37-mm weapon: the compromise eventually thrashed out was that the type would carry the 37-mm KwK L/45 gun, but have a turret ring of adequate diameter to allow later replacement by the 50-mm KwK 39 gun if tactical conditions altered. This was an extremely far-sighted move, and allowed the PzKpfw III to be retained as an effective weapon for about two years longer than would have otherwise have been the case. It is odious to make comparisons, but it is inevitable that one should think of the A12 Matilda II, a potentially formidable British tank that could have played a decisive role if the turret ring had not been sized exactly to the 2-pdr (40-mm) tank gun of the late 1930s and thereby precluded from development with a larger-calibre gun of the type that operations soon revealed to be essential. It proved impossible to design a battle tank down to the desired limit of 15 tonnes, so the upper limit was raised to the 24-tonne rating of Germany’s road bridges, and the selection battle settled down to a choice between the Krupp and Daimler-Benz offerings before the later was selected for production as the PzKpfw III Ausf A (SdKfz 141) after features of the Krupp MKA prototype had been incorporated into the design. In overall layout the PzKpfw III followed the pattern finalised in the PzKpfw I with the driving compartment at the front, the fighting compartment in the centre and the engine compartment at the rear. Crew dispositions were the driver and radio operator/bow gunner in the forward compartment, and the commander, gunner and loader in the fighting compartment/turret. The crew were favoured with considerable working volume by comparison with contemporary tanks of the same basic type, and the driver had the useful advantage of a pre-selector gearbox: this required more maintenance than the crash gearbox used in most other tanks, but offered greater flexibility of operation in conjunction with the 230-hp (171.5-kW) Maybach HL 108 TR petrol engine. The drive sprockets were located at the front, the track on each side passing under the six coil-sprung road wheels before returning via the rear idler and two track-return rollers: this arrangement provided a good cross-country ride and a maximum speed of 32 km/h (19.9 mph). The sensible layout of the vehicle was echoed in a structure of high-grade chrome/molybdenum steel armour: the hull was a bolted-together assembly of three welded subassemblies (the lower hull, the forward upper hull and the rear upper hull), and the turret was another welded assembly. The minimum and maximum armour thicknesses in the prototype were 10 and 14.5 mm (0.39 and 0.57 in), resulting in a weight of 15400 kg (33,951 lb). The armament rather let down the potential of the tank, being the 37-mm KwK 36 L/45 gun and three 7.92-mm (0.312-in) MG34 machine-guns (two co-axial with the main armament and the third in the bow): the main gun had the useful ammunition stowage of 150 rounds, but its indifference as an anti-tank weapon is indicated by its ability to penetrate only 36 mm (1.42 in) of armour angled at 30° at a range of 500 m (545 yards) with its 0.75-kg (1.65-lb) shot fired at a muzzle velocity of 760 m (2,493 ft) per second. 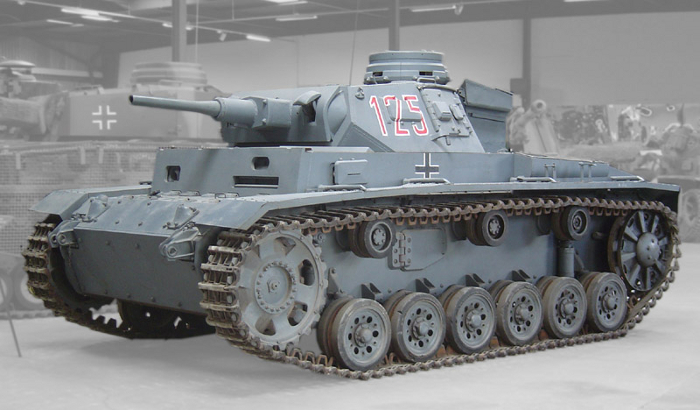 The Ausf A was in reality a pre-production type, and only 10 were built before production switched to the PzKpfw III Ausf B in 1937. This was identical to the Ausf A in all respects but its running gear, which now consisted on each side of eight small road wheels: these were arranged in two-wheel bogies, which were supported in pairs by large horizontal leafsprings; there were also three track-return rollers. Production of this variant amounted to 15 tanks, which were supplanted by the PzKpfw III Ausf C in which the suspension was revised once more, in this instance so that each two-wheel bogie was supported by an individual leafspring. The next pre-production variant was the PzKpfw III Ausf D, evolved from the Ausf C but with the armour increased to a 30-mm (1.18-in) basis: again, 15 of these 19800-kg (43,651-lb) vehicles were built. The final pre-production model (or perhaps initial production model since 440 were built) was the PzKpfw III Ausf E, which appeared in 1938. This had a more powerful engine in the form of the 320-hp (239-kW) Maybach HL 120 TR, a revised transmission and, most significant of all, new running gear. On each side this consisted of six road wheels independently sprung by transverse torsion bars. At about this time the Ordnance Department finally appreciated its short-sightedness in pressing for a 37-mm main armament, and instructed Krupp to proceed with the design of a new turret to accommodate the 50-mm KwK 39 gun. The development had not been completed, however, when the next variant of the tank was being readied for production in early 1940 as the PzKpfw III Ausf F. This 20300-kg (44,753-lb) variant therefore retained the 37-mm gun, so its main improvements over the Ausf E were better ventilation, five smoke emitters on the rear decking, a stowage box on the turret and the HL 120 TRM engine rated at 300 hp (224 kW). The new main armament was still not ready when the PzKpfw III Ausf G was introduced later in 1940, so again this variant retained the 37-mm main gun. It had the same weight and improvements as the Ausf F, but also featured a revised commander’s cupola with improved protection for the vision ports. All three of these variants were retrofitted with the new KwK 38 L/42 gun as this became available, to the annoyance of Adolf Hitler, who appreciated the pace of armoured warfare development and thus demanded the longer and thus more powerful KwK 39 L/60 gun of the same calibre: firing the same round with a 2.05-kg (4.52-lb) shot, the L/42 weapon generated a muzzle velocity of 685 m (2,247 ft) per second, sufficient to penetrate 49 mm (1.93 in) of armour at an angle of 30° at a range of 500 m (545 yards), but the L/60 weapon generated a muzzle velocity of 825 m (2,707 ft) per second to penetrate 60 mm (2.36 in) of armour at the same inclination and range. Stowage of 50-mm ammunition amounted to 99 rounds. Development of the PzKpfw III continued after 1940. The last of Germany’s main tanks with a pre-war pedigree was the PzKpfw IV, which also possesses the distinction of being the only German tank to have remained in production right through World War II for an overall total of some 8,800 examples. The type was planned at the same time as the PzKpfw III, and was essentially similar other than in its main armament, which was the 75-mm (2.95-in) KwK 37 L/24 designed to provide the lighter PzKpfw III with HE fire support. The ordnance weighed 285 kg (628.3 lb) compared with the 37-mm KwK 36 L/45’s 195 kg (429.9 lb) and 50-mm KwK 38 L/42’s 225 kg (496 lb); it fired its 6.75-kg (14.9-lb) APCBC projectile with a muzzle velocity of 385 m (1,263 ft) per second, sufficient to penetrate 41 mm (1.61 in) of armour at an angle of 30° at a range of 500 m (545 yards). In addition to this armour-piercing round, the KwK 37 L/24 ordnance could fire HEAT, HE, Smoke and Case rounds. The standard tank battalion had four companies, and it was planned that while three of these would field the PzKpfw III battle tank, the fourth would operate the PzKpfw IV medium tank in the support role. The design was fixed at a weight not exceeding 24 tonnes, and in 1934 prototype vehicles were ordered under the cover designation BW from Krupp as the VK2001(K), MAN as the VK2002(MAN) and Rheinmetall as the VK2001(Rh). The Krupp submission had large-diameter interleaved road wheels, and this was considered the best basis for a production tank, though only after incorporation of features from the Rheinmetall prototype, including the simpler running gear consisting on each side of eight small road wheels in two-wheel bogies with leafsprings; the drive sprocket was at the front and the idler at the rear, and there were four track-return rollers. In 1936 production contracts were let to Krupp for a vehicle to be designated PzKpfw IV (SdKfz 161), and in overall configuration similar to the PzKpfw III. The crew was disposed in much the same way as in the PzKpfw III, but whereas the battle tank had a manually operated turret, that of the medium tank was traversed electrically. Before the PzKpfw IV entered large-scale production, a number of features were trialled in small pre-production batches, of which the first was the PzKpfw IV Ausf A built to the extent of 35 examples. This weighed 17300 kg (38,139 lb), was armoured from a minimum of 8 mm (0.315 in) to a maximum of 20 mm (0.79 in), and was armed with the 75-mm (2.95-in) main gun plus a secondary battery of two 7.92-mm (0.312-in) MG34 machine-guns (one in the bow and the other co-axial). The Ausf A was powered by a 250-hp (186-kW) Maybach HL 108 TR petrol engine for a maximum speed of 30 km/h (18.6 mph), and its features included the distinctive air inlets on the rear decking and the commander’s cupola projecting vertically through the rear of the angular but moderately well shaped turret. Next came the PzKpfw IV Ausf B of 1938 with a modified cupola, a straight-fronted rather than recessed superstructure, no bow machine-gun, a 320-hp (239-kW) engine and a number of detail modifications; production amounted to 42 machines. The Ausf B formed the basis for the PzKpfw IV Ausf C, which followed in 1939 with a 300-hp (224-kW) engine, an armoured sleeve for the turret machine-gun, and armour increased in maximum thickness to 30 mm (1.18 in), so increasing weight from the 17700 kg (39,021 lb) of the Ausf B to 20000 kg (44,092 lb). Full-scale production began late in 1939 with the PzKpfw IV Ausf D, which was based on the Ausf C but restored the bow machine-gun and introduced a stepped front to the superstructure. Other changes were an increase in the armour thickness of the glacis plate, hull sides and hull rear from 14.5 to 20 mm (0.57 to 0.79 in), an external rather than internal gun mantlet of 30-mm (1.18-in) thickness, eyelid shutters over the five vision ports in the commander’s cupola, a new pattern of track and slightly larger overall dimensions. The up-armouring of the Ausf D indicated that the German army was now becoming seriously worried about the comparatively thin armour of its primary tanks, and this process was continued with the PzKpfw IV Ausf E that was identical to the Ausf D in all but its improved protection and its new turret. The protective features included the thickening of the nose plate from 30 to 50 mm (1.18 to 1.97 in), but though it had been planned to increase the front plate to the same thickness, the design of the bow machine-gun installation precluded this until a new mounting had been designed. Increased protection was afforded to the fighting compartment by the addition of 20-mm (0.79-in) face-hardened armour plate on the sides, and in service the tank was often provided with additional protection by the addition of spaced armour of various types: this generally comprised 30-mm (1.18-in) panels attached over a 75-mm (2.95-in) gap to reduce the effect of hollow-charge warheads. The Ausf E introduced the type of turret that remained standard on production vehicles for the rest of World War II. Some criticism had been levelled at the inadequate protection offered by the 20-mm (0.79-in) thickness of the commander’s cupola, and in the revised turret this was increased to a minimum of 30 mm (1.18 in) and a maximum of 67 mm (2.64 in). The cupola was also moved forward, allowing the installation of a smoothly curved back plate without the distinctive cut-out previously necessary to accommodate the rear of the cupola. Finally the turret was fitted with an electrical ventilation fan to provide better fighting conditions than had prevailed with the original ventilator flap. The PzKpfw IV went through later marks and developments, but these fall completely within the context of World War II and are therefore treated in the next chapter. Germany’s design and industrial capabilities were severely tested by the virtually simultaneous development and production of four major service tanks, yet despite a prodigious effort could not satisfy the army’s requirement in terms of volume and speed of production. To this extent, therefore, the army was extremely fortunate that Hitler’s territorial ambitions encompassed the overrunning of Czechoslovakia’s rump in March 1939 after the ignominious British and French abandonment of the Czech Sudentenland to German demands in the Munich agreement of September 1938: the German army was able to absorb much of the Czech army’s capable tank fleet, and the Czech production capabilities were completely at the disposal of the German war machine.